Click here to view an audio recording and slide presentation by Dr. Irving Pike giving an in-depth overview of GIQuIC. 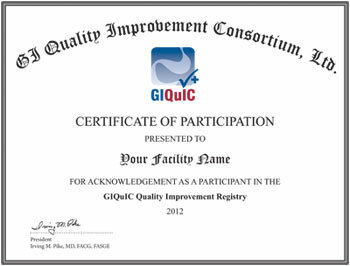 GIQuIC is raising the bar on efficiency, effectiveness, and reliability in benchmarking. Physicians from hospitals, universities, ambulatory surgery centers, and office-based endoscopy units nationwide are participating in this ground-breaking initiative by collecting and electronically reporting on quality indicators for colonoscopy. Establish a national GI endoscopy data repository for storage and maintenance of Endoscopy Quality Measures for GI Endoscopists who want to document and improve their endoscopy performance. Provide Benchmarking reports to participating physicians and facilities to support their quality improvement initiatives. Identify gaps in care and develop Endoscopy Quality Indicators to address gaps. The GIQuIC registry was built and is maintained by FIGmd, which has significant experience in healthcare registry development. To set the standard for measuring and improving the quality of digestive health care. Empirical data to grade Endoscopists’ performance for colonoscopy, esophagogastroduodenoscopy, endoscopic retrograde cholangiopancreatography, and endoscopic ultrasonography are lacking.3 GI Endoscopists formed a national task force to identify and develop quality indicators and suggest methods to collect, empirically analyze, and report endoscopy data.5-8 The goal of the task force was to provide valid and reliable comparative information for consumers and payers. It was the hope that these data would provide a practical, objective method to grade performance as well as prepare the industry for future reporting requirements from public and private insurers. The most important goal is to “provide the best possible patient care…and measure [Endoscopist’s] ability to achieve that goal” (Bjorkman, 2006, pg. 864). From 2006-2009 Sentara Healthcare successfully completed a pilot project whereby physicians from across the country submitted colonoscopy quality indicator data6 to a central repository, using diverse methods of submission. This included extraction both from paper charts and endowriter software. These data collection strategies demonstrate different methodologies and devices, for recording endoscopy procedures, can benchmark using a central data repository. Additionally, benchmark reports can be used to provide physicians feedback on their performance. In 2009, the two GI societies, The American College of Gastroenterology (ACG) and the American Society of Gastrointestinal Endoscopy (ASGE), agreed to take over the project and roll it out nationally. They jointly established the non-profit educational and scientific organization, The GI Quality Improvement Consortium, Ltd (GIQuIC). Institute of Medicine. (1999). To err is human: Building a safer health system. Washington D.C. National Academy Press. Institute of Medicine (2001).Crossing the Quality Chasm: A New Health System for the 21st Century. Washington D.C. National Academy Press. Bjorkman, David J.Measuring the quality of endoscopy. Gastrointestinal Endoscopy 63(4):S1-S2, 2006. Faigel, Douglas O., Pike, Irving, M., Baron, Todd H., et al. Quality indicators for gastrointestinal endoscopic procedures: An introduction. Gastrointestinal Endoscopy 63(4):S3-S9, 2006. Cohen, Jonathan, Safdi, Michael A., Deal, Stephen E., et al. Quality indicators for esophagogastroduodenoscopy. Gastrointestinal Endoscopy 63(4):S10-S15, 2006. Rex, Douglas, K., Petrini, John I., Baron, Todd H., et al. Quality indicators for colonoscopy. Gastrointestinal Endoscopy 63(4):S16-S28, 2006. Baron, Todd H., Petersen, Bret T., Mergener, Klaus, et al. Quality indicators for endoscopic retrograde cholangiopancreatography. Gastrointestinal Endoscopy 63(4):S29-S34, 2006. Jacobson, Brian C., Chak, Amitabh, Hoffman, Brenda, et al. Quality indicators for endoscopic ultrasonography. Gastrointestinal Endoscopy 63(4):S35-S38, 2006. Dr. Eisen is the current managing partner at the Oregon Clinic-West Hills Gastroenterology. In addition he is a Clinical Professor of Medicine at Oregon Health & Science University in Portland, Oregon. He is currently the chair of the ASGE Quality Assurance in Endoscopy committee. He an emeritus editor in chief of Gastrointestinal Endoscopy. Dr. Eisen has served on the governing board of the ASGE, chaired the Standards of Practice Committee, and served on the Informatics, Public Relations Committees and the Quality Task Force. Dr. Eisen has also served as the chair of the imaging and advanced technology section for the American Gastroenterological Association ("AGA") and has served on the Research Committee of the ACG. He has over 250 peer reviewed publications and abstracts. Dr. David Greenwald is the Director of Clinical Gastroenterology and Endoscopy at the Mount Sinai Hospital in New York City, and Professor of Medicine at the Icahn School of Medicine at Mount Sinai. Previously, he was the Fellowship Program Director in Gastroenterology at Montefiore Medical Center/Albert Einstein College of Medicine for nearly two decades and was an Associate Division Director of the Division of Gastroenterology at Montefiore Medical Center in the Bronx, New York. He also served as one of the Medical Directors of the Advanced Endoscopy Center. Dr. Greenwald graduated with a BA from Wesleyan University, and attended the Albert Einstein College of Medicine, where he earned an MD. He did a residency in Internal Medicine followed by a Gastroenterology Fellowship, both at Columbia Presbyterian Medical Center in New York. He is a past president of the New York Society for Gastrointestinal Endoscopy, and currently serves as that organization’s Education Director. He is Secretary of the American College of Gastroenterology as well as a member of the Board of Trustees, and previously was the Chairman of the Board of Governors. He has been active in many ASGE Committees, including having been Chairman of the ASGE’s Public and Member Outreach Committee. He was recognized by ASGE with a Master Endoscopist Award in 2006. He is a Director of GIQuIC, the GI Quality Improvement Consortium. He has been a member of the Steering Committee of the National Colorectal Cancer Roundtable, and is now the Co-Chair of that organization’s Public Relations and Social Media Committee. In New York, he is the co-chairman of the Citywide Colorectal Cancer Control Coalition (C5), and previously was co-chairman of the Quality Subcommittee. He served for many years as the Chairman of the Subcommittee on GI Endoscopy for the American Society for Testing and Materials (ASTM). His interests in endoscopy include new technology, reprocessing and infection control in endoscopy, training, quality in endoscopy, sedation, patient preparation, GERD, colon cancer screening and prevention, and capsule endoscopy. Dr. Schmitt practices at the gastrointestinal specialty arm and is President of Galen Medical Group. She was chief of the Division of Gastroenterology at the University of Tennessee College of Medicine, Chattanooga Unit and founder and Medical Director of Memorial Research Center. Dr. Schmitt attended Jacksonville State University where she graduated with a B.S. in Biology and earned her medical degree at the University of South Alabama. Dr. Schmitt completed her internship and residency at Beth Israel Hospital in Boston before completing joint fellowships in Gastroenterology at Duke University Medical Center and Health Services Research at the Durham VA Hospital, while finishing a Master’s degree in Biometry and Informatics. Dr. Schmitt has served on committees and boards for local and national organizations. She is a past president of the American Society for Gastrointestinal Endoscopy (ASGE). From 2005 to 2009, she served as chair of the ASGE Health and Public Policy Committee and was a member of the Research Committee for several years. She is a past president of the Tennessee Society for Gastrointestinal Endoscopy and serves on the Board of Directors for the Chattanooga Hamilton County Medical Society, and is active with the Tennessee Medical Association. She is a founding physician for Volunteers in Medicine, and a volunteer for the Project Access, organizations that provide healthcare for the uninsured. Dr. Bernstein is the acting chief of gastroenterology at Mount Sinai Beth Israel and clinical associate professor of medicine. He currently serves as the director of clinical integration for gastroenterology and endoscopy for the Digestive Disease Institute of the Mount Sinai Health System. In this role he is responsible for streamlining and integrating gastroenterology and endoscopy operations across 5 hospital based departments and 4 ambulatory surgical centers. Dr. Bernstein has helped develop, implement and now monitor quality measurement and performance across all Mount Sinai Health System gastroenterology affiliates using healthcare IT including data registries and population health management software. He has quality performance and operational oversight of over 75,000 annual endoscopic procedures. As Director of Endoscopy at Mount Sinai Beth Israel Medical Center he oversees administration and operation of 10-12000 procedure per annum hospital ambulatory endoscopy unit. As the medical director of the Provider Partners of Mount Sinai IPA in 2015, Dr. Bernstein was responsible for the development and implementation of a clinical integration program for over 3000 employed and community based physicians. In addition he is engaged in the development and implementation of innovative payment models for the Mount Sinai Health System. He maintains a clinically active practice focused on colon cancer screening and gastroesophageal reflux disease. Dr. Morelli is the President of Indianapolis Gastroenterology and Hepatology and the creator and former Medical Director of the St. Francis Colorectal Cancer Center of Excellence. Central to his practice is his dedication to evidence based treatments for gastroenterological diseases, establishment of outcome measures for ambulatory endoscopic procedures, and development of quality standards for ambulatory endoscopy centers. He has a number of published articles and a book chapter to his credit on gastroenterology disorders and practice management topics. As an active member of the American College of Gastroenterology (ACG) and former Chairman of the ACG’s Practice Management Committee, one of his primary career objectives is to help his fellow members manage their practices. Dr. Morelli served on the GIQuIC Endoscopy Unit Quality Metrics Task Force participating in the formation of measurable quality standards for ambulatory endoscopy centers. For his work in clinical practice, research, service to the college, and GIQuIC, in 2012 Dr. Morelli was named Fellow of the American College of Gastroenterology. In 2013-2018 he was named a top doctor in the city of Indianapolis. Dr. Morelli maintains an active clinical practice with special interests in pancreato –biliary disorders, Clostridium difficile diarrhea, and colorectal cancers. He graduated from the University of Notre Dame in 1993. Then, he attended The Ohio State University College of Medicine. He competed his Internal Medicine residency and Chief Residency at Wake Forest University School of Medicine and North Carolina Baptist Hospitals and his gastroenterology fellowship at the University of Cincinnati University Hospital. The American College of Gastroenterology (ACG) and the American Society for Gastrointestinal Endoscopy (ASGE) have worked together for more than a decade on finding ways to establish scientifically sound standards for training, credentialing and quality measurement. In 2009, ACG and ASGE jointly established the non-profit educational and scientific organization, The GI Quality Improvement Consortium, Ltd (GIQuIC). The registry was developed by Outcome Sciences. Founded in 1932, the American College of Gastroenterology is an organization with an international membership of more than 12,000 individuals from 80 countries. The College is committed to serving the clinically oriented digestive disease specialist though its emphasis on scholarly practice, teaching and research. The mission of the College is to serve the evolving needs of physicians in the delivery of high quality, scientifically sound, humanistic, ethical, and cost-effective health care to gastroenterology patients. For more information, visit gi.org. Since its founding in 1941, the American Society for Gastrointestinal Endoscopy (ASGE) has been dedicated to advancing patient care and digestive health by promoting excellence and innovation in gastrointestinal endoscopy. ASGE, with nearly 12,000 members worldwide, promotes the highest standards for endoscopic training and practice, fosters endoscopic research, recognizes distinguished contributions to endoscopy, and is the foremost resource for endoscopic education. Visit www.asge.org for more information. GIQuIC has partnered with FIGmd, Inc., a company with significant experience in healthcare registry development. FIGmd is the leading provider of healthcare registries and web-based solutions for measuring, improving and reporting on quality of care and patient outcomes. FIGmd provides clinical data registry, analytics, data reporting, and assessment solutions to medical practices, specialty societies, medical professional associations, hospitals, health systems, medical boards and others. FIGmd's technologies, solutions and customization capabilities allow organizations to massively scale their projects in a timely and cost-effective manner. For more information on FIGmd's solutions, visit www.figmd.com..
Gastrointest Endosc. 2006 Apr:63(4 Suppl) S16-28. Among the many quality measures tracked in GIQuIC – adenoma detection rate, cecal intubation rate, and quality of bowel preparation are examples for improving colon cancer screenings and colon cancer detection. Benchmarking of colonoscopy performance for CRC screening provides physicians valuable insight for improving both the quality and cost-effectiveness of their practice. Physicians and facilities as a whole are able to objectively compare their performance measures to other endoscopists and facilities across the country. Eleven colonoscopy measures and 12 esophagogastroduodenoscopy (EGD) measures are currently collected in the GIQuIC registry. Click here to view samples of the Colonoscopy Data Collection Form and EGD Data Collection Form.